Over the last several months I have been looking for and comparing digitization services for audio, film, and for images (slides and more). I have been doing this as part of the ongoing work at the Language and Culture Archive to preserve the linguistic and cultural heritage of the people groups SIL International has encountered and served. I have not come to any hard and fast conclusions on “what is the best service provider”. This is partially because we are still looking at various out sourcing options and looking at multiple mediums is time consuming. Then there is also the issue of looking for archival standards and the creation of corporate policy for the digitization of these materials. I am presenting several names here as the results of several searches for digitization services providers. Last month I was passed a short film on the BBC highlighting one of these providers. The short is well worth the watch because it highlights the reason and madness behind some of the work of digitization. Several of the companies which have come to the top of the list. Another option the Archive has been looking at is to determine if the the quantity of the work is cost prohibitive to have professional done. Meaning that, we would be better served by buying the equipment and doing the work in house. So in the process I have also been looking at people’s experience with various kinds of equipment and technology used in scanning. I have been reading a lot of user stories like Dave Dyer’s reflection on Slide Transfer and MacIntouch Reader Reports from 26 April 2006 on Slide Digitization. 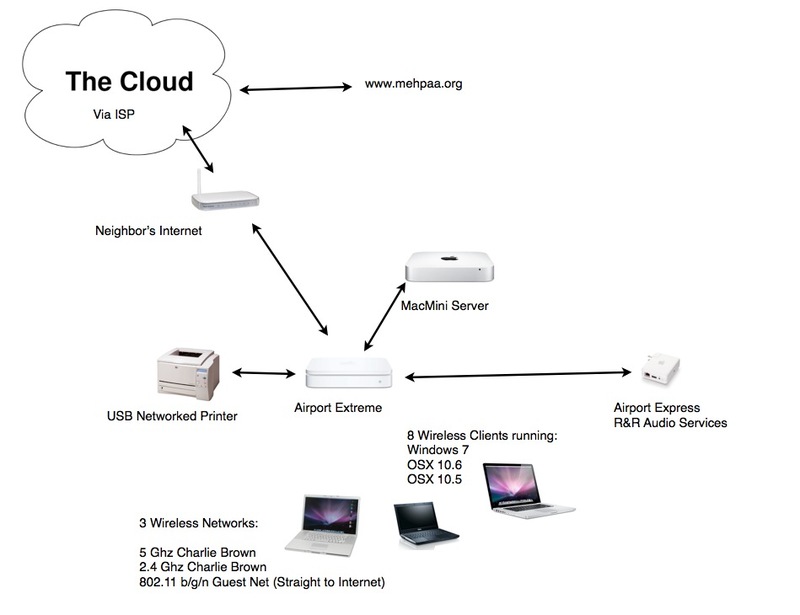 The diagram above roughly illustrates our network setup. This set-up might be typologically rare in terms of language documentation field stations for several reasons. But we had reasonable power (both in quality and quantity), though there were some power outages. And we had high-speed internet. In terms of network set up there was the need for an internet direct out, so that we could have a team network, and then a separate network for language consultants, who would bring their own computers to have a “drop box with us”. To fill this need we could open our network to each of the consultants or we could use an outside service like Dropbox. – I am not sure why we did not use DropBox. Eventually we did use google spread sheets for collection word frames. Our consultants might have been atypical in that they also had their own computers and had some familiarity with computer use. MicrosoftSQL Server for running FLEx on the Network. This is achieved through running XP in a virtual machine via Virtualbox on the OSX Server. We have multi-able entry points of data to the “FLEx System”. We also did not completely solve the network access to the data bases. That is one person could access the database at a time with write access. Since this project the current version of FLEx has moved from a MicrosoftSQL Server Backend to an XML backend. But perhaps what would have been better was to use FLExBridge or LiftBridge. Best practice for backup calls for a three way backup plan. An “across town” backup. Where a (at least weekly) backup is held by a friend or colleague across town. And an out of country back-up. Protect from mistakes or equipment failure. Our onsite backup was handled by Time Machine. We would switch out our Backup drive every week and give it to a colleague across town. We attempted to use KKoncepts for our offsite backup. (KKoncepts did not work out because it was based on a simple rsync script and every time we tried to re-organize folders in our corpus it would try and re-sync all of the Gigabytes of data which lived under the folders.) The DropBox service is much more efficient and looks at the block level (inside the file) and only updates things that have changed. It then looks at the tree structure and mirrors what is currently on the clients computer, rather than re-uploading the content. Not yet well defined are the network settings needed to run WindowsXP in the virtual machine, OS X, and Windows 7, establish a DNS server with AirPort Extreme.Note: Although the title/URL says “Multi-lingual” this is to be understood that multiple languages are being documented. The term poly-lingual also fits this particular project because the language of communication and authorship was Spanish, yet many of the network issues were resolved in English. One user on in a small business / family network can’t use (with metadata) all the media in a colleague’s or family member’s iTunes or iPhoto Library. In our family there are three Macs (2 everyday machines and a server). On many work and personal tasks we function as a small workgroup. Unfortunately iTunes and iPhoto do not facilitate the sharing of media libraries (or for that matter the merging of media libraries). For instance, my wife had her own music and photo collection before we got married. Now if I want to browse that collection from my machine, there is iPhoto & iTunes sharing. But I can not add tags or other metadata to photos on her Mac. I can not create smart folders which we both can use. For our music we moved my collection to the Server and made it like a “media center”. When we get new music we add it to the server. If we want a copy on our own machines we pull it as needed. i.e. for an iMove project. This solution has not allowed my wife to add her collection to the server, nor has it solved the manny duplicates which exist because we like many of the same songs. Now I have found a solution to this: PowerTunes. Now the same problems exist for our photos. However, there is no real advantage (or software) for hosting the family photos on our sever. But we still need to define a photo capture strategy. When we take new photos, to which computer are we going to download the photos? Where will we have the master library? Designate an computer to be the Master Library holder. Share that iPhoto library across the network.